For as long as anyone can remember, introductory physics at the Massachusetts Institute of Technology was taught in a vast windowless amphitheater known by its number, 26-100. M.I.T. is not alone. Other universities are changing their ways, among them Rensselaer Polytechnic Institute, North Carolina State University, the University of Maryland, the University of Colorado at Boulder and Harvard. In these institutions, physicists have been pioneering teaching methods drawn from research showing that most students learn fundamental concepts more successfully, and are better able to apply them, through interactive, collaborative, student-centered learning. 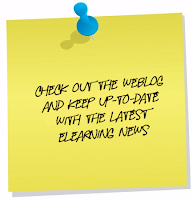 United States Distance Learning Association launches new community website to generate broader awareness, knowledge and research for distance learning. The United States Distance Learning Association (USDLA), the recognized worldwide organization of dedicated professionals committed to the distance learning industry, and introNetworks, the premier smart social network company for online communities announced today their partnership in the launch of USDLA's new website (www.usdla.org). The USDLA site (www.usdla.org) averages 2.6 million hits per month. The partnership with the foremost social networking company, introNetworks, allows USDLA to take advantage of the value of member networking and mentoring possibilities within its global organization. Members of the distance learning community can seek out others with similar backgrounds, talents, and interests, encouraging career growth and collaboration. The new site focuses on the importance and impact distance learning has in 21st century education across many market segments including education, healthcare, government, and corporate. It affords distance learning practitioners the opportunity to explore and become involved in an essential part of today's changing society. "The world of learning is changing. Distance learning is a multi-billion dollar enterprise and the fastest growing segment of the education market. With the guidance and input of USDLA Advisory Committee members, the design and programming excellence of Emantras, and the creative community-building ingenuity of introNetworks, the new site inspires and offers a personal and authentic connectedness and service-oriented call to action for the distance learning industry" notes Julie Young, USDLA President & Chief Executive Officer, Florida Virtual School. "The focal point of the new website is the introNetworks Social Community which has established an effective learning community with just-in-time learning and resources for USDLA members. USDLA is now able to maximize informal learning for member development by intelligently matching members to the people and resources they need most" notes Reggie Smith III, Booz Allen Hamilton, USDLA Board Member and Chair, Awards and Public Policy Committees. "We are thrilled to be at the center of this strategic initiative of the USDLA. Building a connected community has become a prime initiative of this forward thinking organization and their leadership. Our focus has been to make the USDLA Community visual, easy and smart to help achieve the organizations goals; to have a place to talk about trends, meet peers and discuss challenges with others interested in the many facets of distance learning," says Mark Sylvester, CEO, introNetworks. Schools expect the number of online students to grow to over 2.6 million. 40.7 of schools offering online courses agree that "students are at least as satisfied" with their online courses, 56.2% are neutral and only 3.1% disagree. e-Learning is now estimated to represent about 10% of the overall training and educational market. Online students, especially undergraduates, are more likely to be studying at Associates institutions than are their face-to-face contemporaries. The proportion of institutions with fully online programs rises steadily as institutional size increases, and about two-thirds of the very largest institutions have fully online programs, compared to only about one-sixth of the smallest institutions. Online students, like the overall student body, are overwhelmingly undergraduates. Based in Santa Barbara, CA, introNetworks offers smart social networks that are dedicated to helping people identify, and then make meaningful connections to who and what matters to them in their work and interests. Since 2003 the company has successfully deployed over 250 introNetwork Systems across a growing customer base that includes such high profile companies as Adobe, British Airways, Starcom MediaVest, HP, Harvard, Autodesk, Fortune, Xerox, Ziff Davis, and Intel. These companies have learned that introNetworks' smart social networks are the best way for any organization to deploy a valuable online community that allows all of its members to identify and connect with the people and information that matters to them in business, special interest groups, learning communities or at events. The United States Distance Learning Association is a non-profit organization formed in 1987 and is located in Boston, Massachusetts. USDLA promotes the development and application of distance learning for education and training and serves the needs of the distance learning community by providing advocacy, information, networking and opportunity. Distance education and training constituencies served include pre-k-12 education, higher and continuing education, home schooling, as well as business, corporate, military, government, and telehealth markets. For more information regarding USDLA activities, contact Dr. Flores, Executive Director, or visit www.usdla.org. Kelly Sonora has been in touch to reminds us about the following article below. The Internet is full of useful tools and hacks that keep you more focused and efficient, but you have to know which ones are best. This large list of 101 Google tricks can help you lead a more streamlined, stress-free existence, from your professional life to your personal life. Everything (mathematics) is illuminated in this excellent thirteen-part series created by Annenberg Media for adult learners and high school teachers. 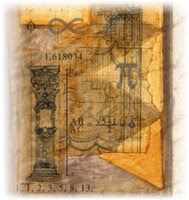 As their website notes, the series "explores major themes in the field of mathematics, from humankind's earliest study of prime numbers, to the cutting-edge mathematics used to reveal the shape of the universe." First-time visitors can read a brief introduction to the series, and then look over some of the thirteen units, which include "Game Theory", "Other Dimensions", and "Geometries Beyond Euclid". Based at Boston University, the Gateway to Philosophy project provides users with access to papers presented at the World Congress of Philosophy, as well as other initiatives of a philosophical nature. 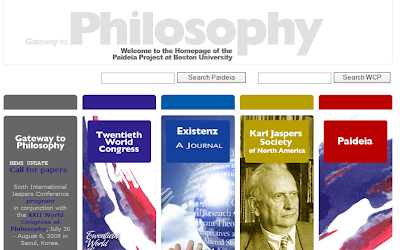 The site is divided into five primary sections, including "Twentieth World Congress of Philosophy", "Existenz", and "Paideia". Visitors may wish to start their journey through the site by clicking through the World Congress section, where they can read all of the papers presented at the World Congress of Philosophy and learn about the media coverage of this event. 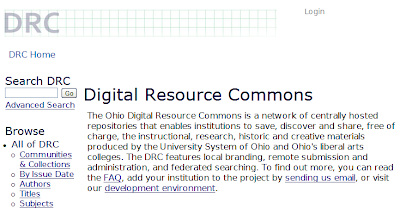 The Ohio Digital Resource Commons (DRC) is a place to learn about the historic, instructional, cultural, and creative works of those in the Ohio University system, as well as the liberal arts colleges of Ohio. Although not all of the Ohio schools save material with the DRC, many of them elect to do so. Higher education institutions, as well as K-12 institutions are allowed to save their work via the central network, as long as the work has archival merit. Visitors will want to click on "Communities and Collections" on the left hand menu to browse the vast resources available. Some of the communities included are "Art and Architecture", "Multi-Subject Video", and "OhioLINK Electronic Thesis and Dissertation Center". The Feminist Press at the City University of New York recently launched UnderTheMicroscope.com in conjunction with IBM in an effort to increase public awareness of the need for women in science-related fields. The site aims to celebrate the achievements of women in science, while openly discussing the challenges they face, and also inspire more young women to pursue science careers by providing a social-networking forum for students, working scientists, teachers, counselors, and parents. More than half the women—mostly in their mid- to late-30s—working in science, technology, and engineering careers today leave these fields, citing isolation, condescending attitudes toward women, and a lack of role models among their primary reasons, the site’s creators say. Stephen Downes writes, "This site, Academic Earth, presents "Thousands of video lectures from the world's top scholars." It seems that "top scholar" is being defined as one who teaches in one of the name U.S. universities - a rather narrow definition of "top scholar" if you ask me. That's not to say that they're bad - I sampled a number of them and they are, as expected, clear, articulate and authoritative." In an increasingly and globally competitive world, education is the key to advancement, and people without high school diplomas are not likely to do well in the 21st century. The good news is that the United States high school graduation rate is fairly high and college attendance has become the norm in many places. The bad news is that in some areas graduation rates are extremely low, which leaves the students at risk for failure in school, work, and their futures. In this eBook, we hope to provide insights and solutions for increasing high school completion and solving the urban dropout crisis. Articles here deal with the issues of academic and economic competitiveness, goals and strategies for educating at risk students, personalizing instruction, and technology and motivation. Solutions for secondary schools include employing online learning and 21st century learning with policies to encourage their use. We hope you will find this ebook valuable as you address the needs of at risk students and high school completion in effective and cost-effective ways. 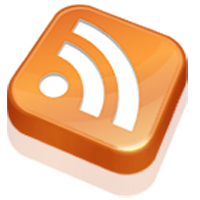 Blogs, Facebook, Twitter - all are forums in which people are suddenly prepared to share anything from heartbreak, marital discord and a diagnosis of chlamydia to what kind of new stair carpet they are getting. Even celebrities, who you might think would have enough public exposure, cannot seem to resist the extra fix of performing to an audience. Pamela Briggs, Professor of Psychology at Northumbria University, whose research interest is in computer-mediated communication, says that people compensate for the fact that they don't get the complex interaction of face-to-face conversation by putting more into their e-mails and blogs. And it tends to be “the sparser the medium the richer the revelations”, she says. Rob Gear, manager of PA Consulting’s IT Innovation Unit, gazes into the future. IT will become more pervasive but computers will blend into the background: into your car, desk or table. We’ll even have smart curtains that change colour. Using them will be simpler, too. A wave of your hand or an oral command should do it. 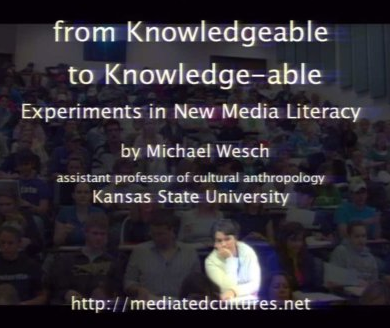 This hour-long podcast features a keynote speech by Michael Wesch, Assistant Professor of Cultural Anthropology, Kansas State University. The presentation was delivered at the ELI 2009 Annual Conference. A video stream of this address is also available. It took tens of thousands of years for writing to emerge after speech, thousands more before the printing press was invented, and a few hundred more for the telegraph to arrive. Today, new ways of relating are constantly created and a new communication medium emerges every time someone creates a web application—a Flickr here, a Twitter there. How can we use new media to foster the kinds of communication and community we desire in education? This presentation discusses both successful and unsuccessful attempts to integrate emerging technologies into the classroom to create a rich virtual learning environment. And the new release will feature expanded Web 2.0 and “social learning” tools, such as blogs and journals, enhanced notification capabilities (i.e., “Your paper is due in four hours” – or four days), and a redesigned, customizable user interface. This handbook attempts to make the results of three years of work within the specific, targeted research of the iCamp project accessible. 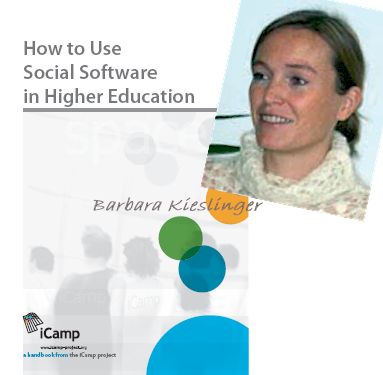 In the European Commission funded iCamp project we have investigated how Web 2.0 technologies can be implemented in higher education settings. More specifi cally, we have focused on a setting in formal higher education in which actors are distributed geographically, culturally, and across disciplines and have designed an approach through which learning processes in this setting can be supported with social software. In preparing this handbook, we chose to arrange the tools according to the learning activities they support. Each chapter should be read in the context of these activities. Our aim is to provide you with an entry point into the application of social software technology to support learning. The handbook is both a guide and a resource for anyone considering making use of Web 2.0 technologies in teaching or learning. CALL FOR PAPERS: NEW LEARNING GENERATION. eLearning Papers is looking for essays on topics related to the new learning culture and generation impelled by ICT. The papers may address themes such as new social media in learning, changing learning cultures and habits and learning through mobiles and games. Article submission deadline: 30 March 2009. PROJECT OF THE MONTH. KeyToNature is funded under the eContentplus programme and it aims to develop interactive e-tools for learning and teaching biodiversity. The project is developing a range of new tools for the identification of organisms to be used in schools and universities across Europe. The identification tools are available on a variety of platforms, including laptops and mobile phones. EDEN 2009 ANNUAL CONFERENCE, 10-13 June 2009, Gdansk, Poland. The European Distance and E-Learning Network invites European academic experts and professional practitioners to contribute and share innovative experiences on the significance and impact of learning innovation in Europe. LEARNTEC 2009, 3-5 February 2009, Karlsruhe, Germany. The LEARNTEC 2009 will once again present the future of learning as well as the latest e-learning solutions for companies and educational institutions. Experts on e-learning and knowledge management will find at the event the right products, applications and services to meet each specific need. Whereas the LEARNTEC Convention will focus on future issues and cutting-edge trends in development, the Trade Fair will showcase both successfully implemented applications and cutting-edge new developments. Professional and business services are projected to grow by over 23 percent in the next eight years. Because of the numerous business degree programs available, deciding on a program can be difficult. However, eLearnPortal.com, a web-based directory resource, has a complete guide to online business degrees for anyone considering a new or upgraded career in the business field. After the failure of numerous banks and lending agencies in the United States, the economy is on the fast track to a recession. As a result, many industries are downsizing and cutting back on hiring new employees. However, the Bureau of Labor Statistics projects the business field to add over 4 million new jobs in the next eight years. As a result of this growth in the business sector, many people are pursuing online business degrees. Choosing an online business degree program can be difficult, but visitors to eLearnPortal have access to a distance learning resource for online business degrees. This guide details all the information that future business degree students need to know about the field, including: job prospects, salaries, curriculum, employers, major industries, and the best online business programs. www.eLearnPortal.com – the virtual place where students and schools can find their perfect academic match. eLearnPortal aims to gather under the same roof all of the online programs and degrees offered by small colleges and universities across the country. This educational directory and resource tool not only offers potential students the opportunity to browse the online degrees, programs and courses offered by small, traditional colleges, but strives to meet all the needs of the online student. This one-stop solution in distance learning provides a simple-to-navigate online menu, where students can search by online program (business, education, social work, etc. ), online degree (bachelor’s, master’s, certificate, etc.) or name of school. With eLearnPortal, the right school is only a click away. To ensure a student connects with his or her campus community, detailed information about each school is available to prospective students through individualized landing pages. Each school’s landing page describes in depth its online campus, online programs or online courses. The landing page also offers links to individual degrees, programs or courses offered by the respective school. By clicking on a link, students are led to further information on the school’s academic offerings. At any point in his or her search, a student can request more information about a program by filling out a short Information Request form. By doing so, the request will be sent to the selected school, followed up by a email or phone call and thus, place the student in direct contact with the institution of choice. Educating.net is proud to announce the completion of its major renovation. In keeping up with the breath taking speed at which the Internet has evolved, Educating.net 2.0 meets the newfound capacities of the Web 2.0 and e-learning 2.0. Educating.net is one of the oldest and most respected vertical portals on the Internet for educational services.Founded in February of 1999, Educating.net is celebrating its 10th anniversary with a major new look and function for its website. Users will find the beautiful new home page easy to navigate with colorful pictures and many options to choose from. Of the more than 10 million sites on the web that might be considered relevant to education, Educating.net has filtered and sorted these down to a manageable 2000 sites that provide convenience and one stop shopping for education on the Internet. E-learning provides the student with convenience and flexibility, since the student no longer must travel or be someplace at a given time. Many e-learning classes are conducted at the student's convenience, meaning "asynchronous". E-learning has the potential of reducing pollution by limiting the needs for students to travel to their school site. Just sit at home in front of your computer to do your work. Much of the work is conducted in a paperless atmosphere online, further providing environmental advantages in saving trees. Education on the Internet presents the distinct possibility that education could become affordable to the many areas of the world, such as Africa, Asia, and South America, where insufficient teachers and/or classrooms exist. Educating.net is the only education portal that offers complete opportunities for training in all areas of life. Educating.net is unique in all of the Internet because we use real human intelligence to seek out websites, visit them, write a concise summary of the site, then categorize and add it– but only if the site meets our high standards. No computer search engine can match the quality, accuracy, and completeness of our education portal. Kaplan University launched the "Talent Campaign," a new ad campaign designed to drive awareness that many of today’s college students, especially adult learners, are not well served by traditional classrooms. Kaplan University’s debut ad is a 60-second commercial depicting a professor standing before a lecture hall of students. In the spot, the professor apologizes to his class, acknowledging that the higher education experience does not have to be limited to classrooms. He points out that it can be delivered in alternative ways to serve students unable to access traditional colleges and universities. Many of today’s college students need coursework and related university services tailored to their needs as employees or parents. The ad also includes Kaplan University’s new tagline – A Different School of Thought – and describes how the University is redefining higher education. Kaplan University offers a different school of thought for higher education. It strives to help adult students unlock their untapped talent by providing a practical student-centered education that prepares them for careers in some of the fastest-growing industries. Based in Davenport, Iowa, the University is regionally accredited by The Higher Learning Commission (HLC) and is a member of the North Central Association of Colleges and Schools (NCA). Kaplan University offers more than 100 academic programs and currently serves more than 48,000 online students. It also serves thousands of on-ground students through eight campuses in Iowa and Nebraska. Kaplan University is part of Kaplan Higher Education, which serves more than 100,000 students through 70 campus-based schools across the United States and abroad. It also has online programs through Kaplan Virtual Education and Concord Law School of Kaplan University. Kaplan Higher Education schools offer a spectrum of academic opportunities, from high school diplomas to graduate and professional degrees, including a Juris Doctor degree. Kaplan Higher Education is part of Kaplan, Inc., a subsidiary of The Washington Post Company (NYSE: WPO). The number of texting addicts is on the rise.